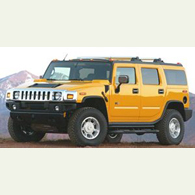 (autoinsidernews)- General Motors will shut down production at the AM General plant in Mishawaka, Indiana that builds the HUMMER H2. As sales of the massive SUV have slowed, inventory has built up on dealer lots so GM has decided that halting production will avoid adding to the over-supply, reports Trend. Earlier this year, AM General transferred 170 workers from its H2 line to the Humvee plant and parts operation. That move was also due to slowing sales and production of the H2. The H2 plant employs about 600, which is down from a peak of about 1,000 a few years ago.